South African cleric and Nobel Laureate Desmond Tutu has apologised to Nigeria over the xenophobic attacks on the country's citizens, as well as other Africans, in 2008. 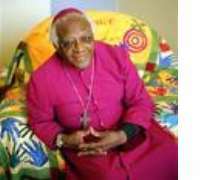 Speaking in Yola, capital of Adamawa state in Northern Nigeria, at the weekend, Tutu said his country owed Nigeria a huge debt for the assistance it offered to South Africa during the struggle to end apartheid, the private Guardian newspaper reported Monday. Nigeria played a major role in freeing South Africa from the clutches of apartheid, but that did not stop Nigerians - as well as other Africans - from being attacked in the series of riots that broke out in May 2008 and left 62 people dead. Nigerian foreign affairs experts have blamed the South African government for not doing enough to educate the younger generation about the role played by Nigeria and other African nations during the anti-apartheid struggle.